It seems like Atlantis just docked a few days ago, but their mission here is done. It has been absolutely exhausting, but awesome at the same time. The STS-135 crew (Chris, Doug, Sandy and Rex) were wonderful to have onboard!! I won’t call them guests because they were more like family. What an awe-inspiring day today! It’s way too late to still be up, but Ron Garan and I completed a six and a half hour spacewalk on the ISS while supporting the STS-135 space shuttle mission and I’m still pumped with adrenaline. 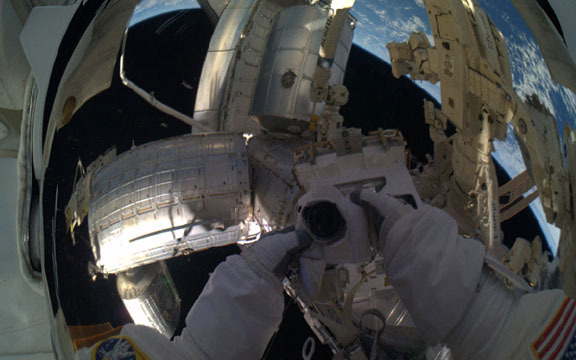 This was my 7th spacewalk in 5 years. That, in itself, is hard to believe. It’s even harder to believe this is the end of an era and we are participants. In this case, “we” means all of us — including you. For 30 years, the United States has flown a small fleet of spaceships named Columbia, Challenger, Discovery, Endeavour, and Atlantis. We have suffered through tragedy and cheered the triumphs. Someday you will tell your grandchildren about these amazing flying machines we used to have. I’m saving up stories now to share with Rebecca Anne as soon as she’s old enough to understand and I’ll happily repeat them for her cousins. We have paid dearly in terms of sweat, blood, and money for what we have learned over the last decades. Only through such perseverance can we hope to advance humankind. Our future may present us with challenges, but we press on because we must. 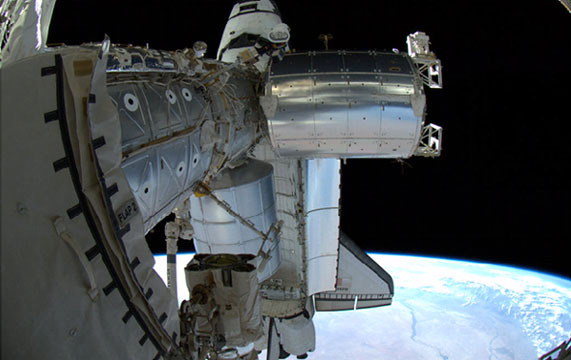 From the beginning of the program, one of the space shuttle’s envisioned missions was hauling big pieces of hardware up to space from which we could build a space station. With that monumental mission accomplished, we have decided to retire this venerable workhorse. Other vehicles will follow someday. But for today, it was humbling for Ron and me to be the last spacewalkers to work in a Space Shuttle’s cargo bay. Before I entered the ISS airlock for the last time, I was held spellbound looking back at the majestic view of Atlantis perched on her docking port at the front point of the station. In only a few days, she’ll be winging her last crew home. Let’s enjoy every minute and lock in the memories to share until the next amazing flying machines light up the sky, hurtling their trusting crews toward the heavens while we watch, pray, and cheer from earth below. Atlantis is on the way! With weatherthreatening to delay the mission and an interruption in the countdown at 31seconds (!) before launch, the crew of STS-135 has begun their voyage!! 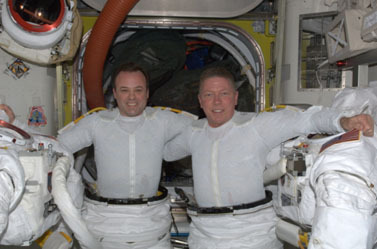 Ron Garan and Iduring suit fit check a couple of weeks ago. Aftertraining underwater for over 250 hours together and doing 3 spacewalks onSTS-124 three years ago, we definitely have a feeling of “Getting the band backtogether”! 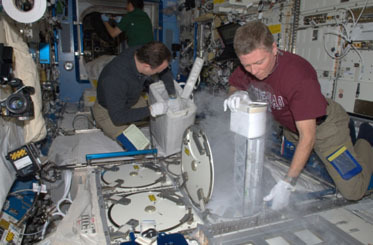 Collecting samples from a freezer,which stops all biological activity at a crisp -98OF. This spaceshuttle flight will be our last opportunity to get a lot of these valuableresearch samples home for a while. 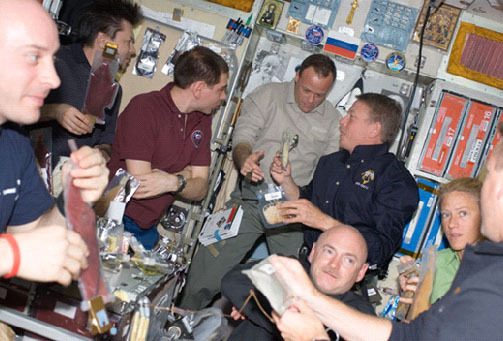 The period of time leading up to thishistoric event has been unbelievably busy on the International Space Station.We arrived exactly one month ago on June 9th. 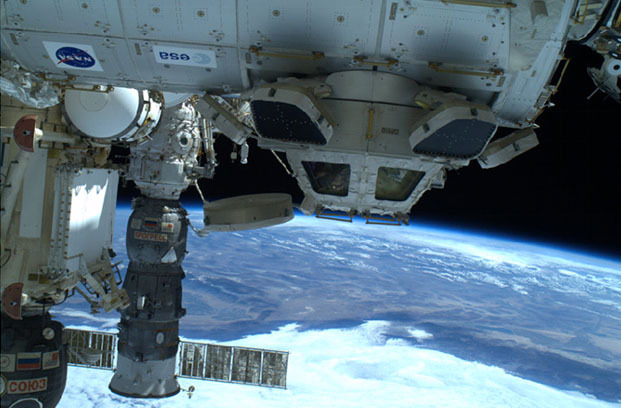 We’ve been busypreparing the ISS, preparing for our spacewalk while they are here, andcollecting scientific and engineering samples to go home on the last spaceshuttle. As busy as each day can be, all workstopped yesterday as we watched the launch of Atlantis with a live video feedfrom Mission Control in Houston. The major event overshadowing all of our workfor the last month has been preparation for this mission, so it was appropriatewe joined the rest of the world in viewing this historical event. There are a wide range of emotions whichrun through you watching any human space launch. Those haven’t changed muchsince I watched as a child: Excitement, fear, anticipation, wonder, and hopefor the future. We hold our collective breath as the beast roars to life.Cleared the tower – check. Good roll program – check. Go for throttle up –check. Solid rocket booster separation – check. Go for nominal main engineshutdown/go for pitch maneuver – check.The cadence of a highly-trained crew onboard Atlantis and on the ground is likemusic to our ears. There are challenges and much work ahead, but for now, allis well. Thisis the only photo we have onboard the International Space Station ofyesterday’s launch of Atlantis to begin STS-135. 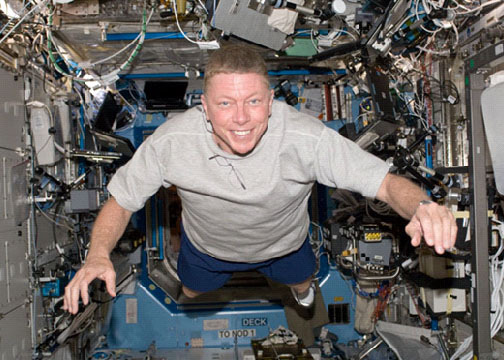 Since you’re reading this, you have at leasta passing interest in our nation’s space program and have probably seen dozens,if not hundreds, of photos of this historic event. I don’t need another one. After 30 years ofspace shuttle missions, this one says it all for me. Make no mistake, the preparation andlaunching of any spacecraft is a tough business for tough people. This is truefrom the top managers who have to make the tough decisions to the technicianson the ground who hone their rocket maintenance skills on the weekends keepingtheir Harleys in perfect running condition. They prepare that spacecraft foreach mission with the same tender loving care they use to polish the chrome toa perfect shine for a Sunday ride. For us astronauts, that’s not “our” spaceshuttle. The technicians who care for them daily make it very clear theyconsider each to be “their” space shuttle. The ground team just allows us takeeach vehicle out for a ride and we better bring them home in good shape! Youhave to really trust someone to loan them your bike. Same goes for spaceships! 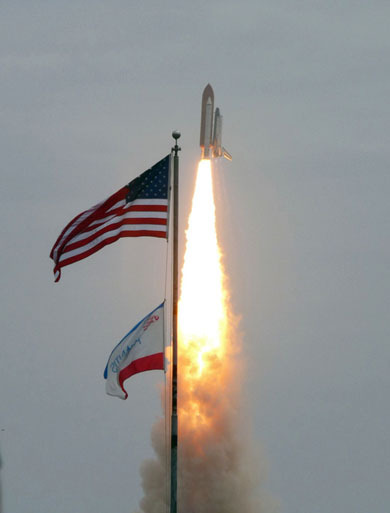 The spaceshuttle launch image is one which symbolizes America. It is powerful, huge,tough, bold, and at times audacious. Today the famous launch pads at KennedySpace Center have gone silent. We’ll have more time to ponder the implicationslater. For now, we have a mission to execute. Come on up,Atlantis! We’ll leave the lights on for you and have a cup of coffee waiting!! It’s hard to believe we’re starting our 2nd full week up here! The past 11 days since we arrived at the ISS have been a blur of physical adaptation to space and mental adaptation to working in zero-G.
For ISS, a significant part of our training is devoted to our ride up – the Russian Soyuz spacecraft. 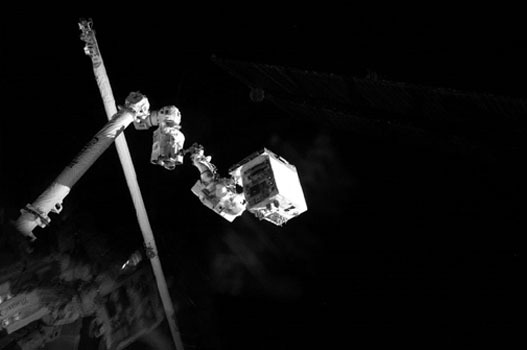 That 50-hr ride up and 4-hr ride home after 5.5 months requires a huge dedication of time and training resources, but it doesn’t help us prepare to operate the space station. In addition, the ISS is a huge place. (My previous rough estimate was about 5 Greyhound buses in size. After already searching unsuccessfully for several things, I must recalculate my estimate.) Finally, with laboratories and systems built in countries around the globe, there is simply too much here for one person to learn on the ground, so a good part of our training is OJT or “On the Job Training.” That’s frustrating at times (for all involved), but we’re picking up speed quickly. I have time for one quick story about adaptation that is hard to imagine back home. When you let something go, it doesn’t fall in the general area around your feet. It scatters in a growing sphere around you, but your instinct is to look “down” for the missing thing. (Wherever your brain interprets “down” to be, that is….) So you lose things. You may have heard me tell the story about losing my fork on the second day of my first shuttle mission five years ago. 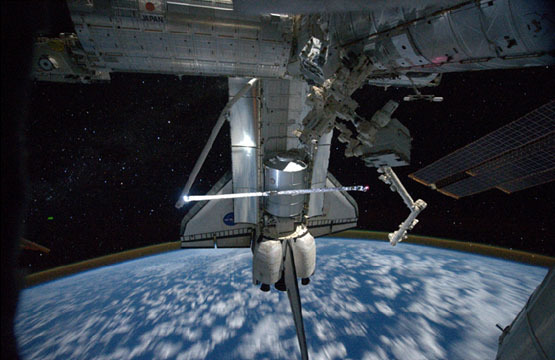 The photo below is from my STS-124 mission. I looked and looked for that darned thing, but ate with a spoon until the day we were packing up to come home. While adjusting and tightening some bags for reentry, my fork came floating into the cabin. It happened again. On our second night here in the ISS, we had dinner in the Russian Service Module and my silverware (really “eating utensil”) kit didn’t make the trip back with me. Here we go again! I got luckier this time – Sergey found my kit in the FGB lodged in some stored equipment. I’ve managed to keep track of my silverware for a whole week now, so things are looking up!